HAPPY NEW YEAR my faithful, fabulous readers!! I hope Father Time helped you all usher in a fantastic and fun 2014. I, personally, have vowed to make this year the most fit and fabulous one yet (don’t you love the alliteration?? Twenty-fourteen is now officially the year of the ‘F’), and have come up with lots of resolutions to keep myself motivated in the new year — one of which is writing more frequently to you wonderful people! Another is to run a half marathon… we’ll see which one is more successful. Yet another resolution of mine is to try lots of exciting, new and exotic foods. After all, isn’t that one of the major perks of living in Chicago, the ethnic food mecca?? I decided this resolution will have to wait until tomorrow, however; today, January 1, 2014 would not be the day for New and Exotic. Instead, I elected to make breakfast this morning following the theme of Tried and True. During my first waking moments of the new year I went back to the basics, back to my roots, and whipped up some phenomenal Challah French Toast. This recipe, though a rare treat reserved only for special occasions, is an absolute favorite of mine and it is genuinely simple to make. The braided challah, in my opinion, is the secret ingredient because it is so deliciously fluffy and light (it is even better if you use bread that’s been sitting around a few days, because it absorbs more of the egg batter before cooking). But the richness of the batter and the combination of textures from the crispy fried shell and the slightly sweet, moist interior made it the perfect way to say “Hello” to a florid 2014! And, if you’re looking for some inspiration for your own resolutions for the upcoming year, check out this great list I found on Pinterest to help get your ideas flowing. In a medium bowl, whisk together the milk, eggs, flour, brown sugar, vanilla, cinnamon, and salt. Pour the liquid mixture into a shallow baking dish or pie plate. Soak slices of challah in the liquid for about 60 seconds, turning once, until the bread is soaked through on both sides. Heat skillet over medium heat or griddle to 350 degrees. Grease the surface with butter or cooking spray. Fry the toast in batches, sprinkling a bit of extra cinnamon over the top, if desired, for a fancier look. Let the slices brown on each side for 3-5 minutes. 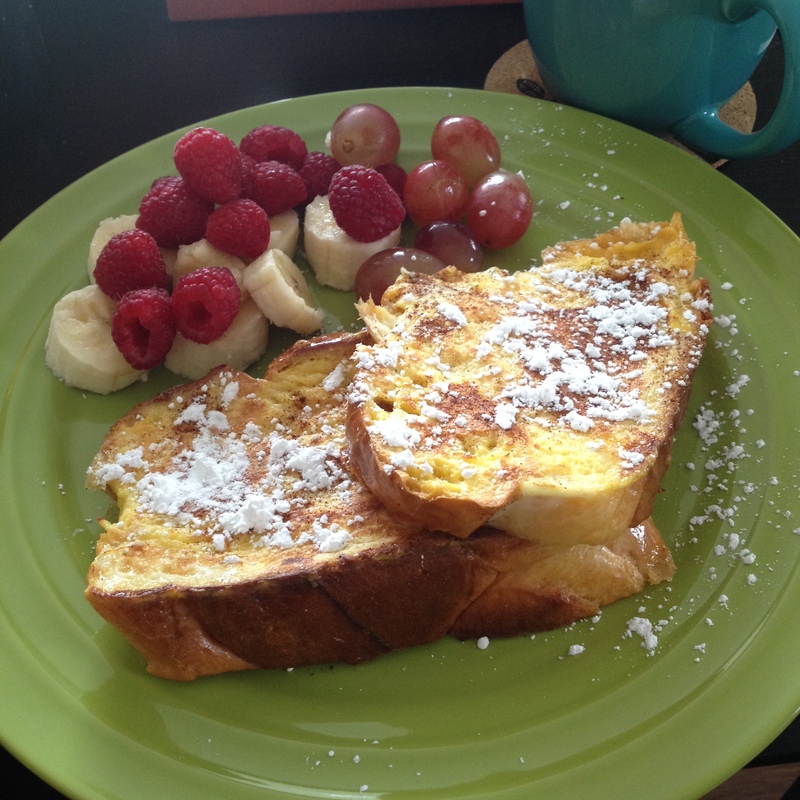 Plate the French toast with fresh fruit and garnish with powdered sugar. 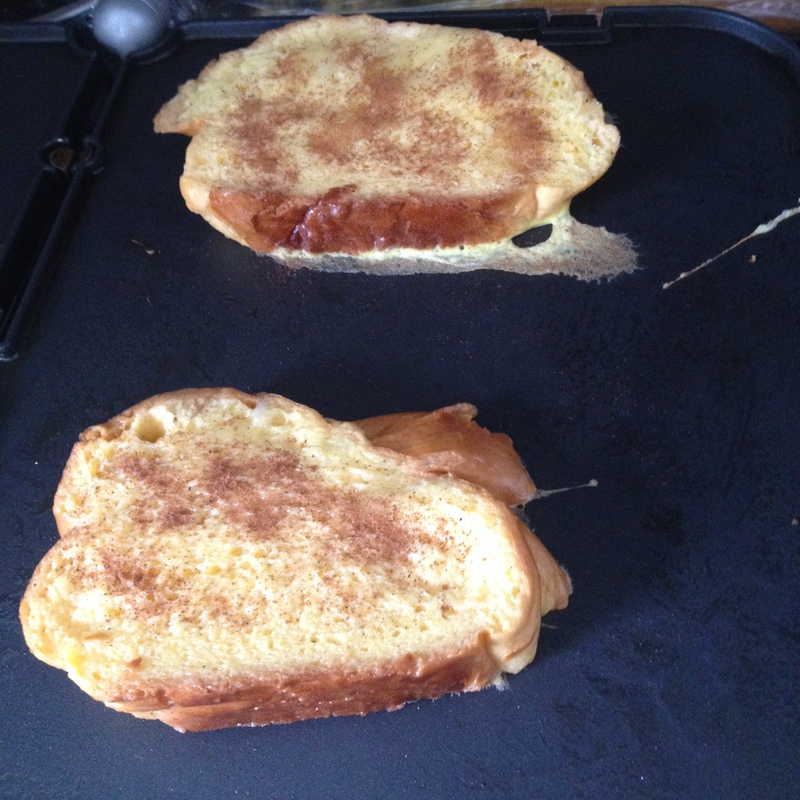 Posted on January 1, 2014 by Jilly G	• This entry was posted in Inspirational, Recipes and tagged 2014, breakfast, challah, french toast, griddle, new year, resolutions. Bookmark the permalink.